The former Wendy's in Cedartown on Main Street is soon to be demolished and replaced with a Popeyes Chicken, the second the chain will have in Polk County. CEDARTOWN — Out with the old and in with the new. That will be on the agenda in the coming weeks as the old Wendy's restaurant is torn down to make room for a new Popeyes Louisiana Kitchen. The familiar structure at 302 Main Street will be demolished within the next three weeks, according to Cedartown Building Inspector Joseph Martin. Once that building is down, new infrastructure will be set into place and a new Popeyes restaurant will soon take shape. The new restaurant, that is known for their chicken (especially the fried kind), will be housed in a 2,145 square-foot building. A firm date for the restaurant opening is not known, but estimates are that it will open sometime this summer, depending on weather conditions. The new location will be the second in Polk County as Popeye's in Rockmart is near completion and an announcement about it's official grand opening should be coming within the next several days. As of 2016, there were 2,600 locations across the country and growing. Popeye's Chicken was founded in 1972 in New Orleans, and since has spread throughout the decades across the nation in competition with KFC. Their menu not only features fried chicken, but also fried seafood, sandwiches and more with a spicy, Cajun-style kick. Popeyes already have locations Rome, Calhoun, Cartersville, Douglassville, Hiram and all across the metro Atlanta area, among many others across Georgia. The former Wendy's location in Cedartown closed their doors in 2014. The M.E.R.I.T. Award winner was Julie Durham of Van Wert Elementary School (center) pictured with Board Chair Bernard Morgan, Superintendent Laurie Atkins, Floyd Medical Center's Dan Bevels and Assistant Superintendent Katie Thomas. Timothy Warren at Youngs Grove Elementary was named the PREA New Educator Grant winner during the March 2019 regular board meeting. He's pictured with PREA's Gladys Gipson. Honoring staff, board members and locking down annual agreements were all on the agenda for the March Polk County Board of Education's regular session for the month. Among the items approved unanimously during the March 12 session included an agreement for the Polk School District to continue on with school nursing services provided by Floyd Medical Center's regional program with only a slight increase in the amount the district is paying for nurses in every school. Superintendent Laurie Atkins told board members that per their agreement previously made with Floyd Medical Center for providing the services in their renewal for the rest of the year and into 2020 with a 3 percent increase over the previous amount of $359,000 made in a deal in 2017. That's just a $10,770 increase in the agreed upon price for services. That now put the total cost at $369,770 for the program, which provides nurses at the high schools, middle schools and all the elementary school campuses within the district. The board agrees to make quarterly payments to FMC to the tune of $92,442.50. Board members also approved the annual agreement to pay part of the cost for the 4-H Extension Program Assistant Position at a total of $5,004. That goes back to the University of Georgia who runs the Polk County Extension Office headed by Ricky Ensley in a program for youth organized by Dora Williams. These are just some of the expenditures in the FY 2019 budget that is moving right on track for the year, and has additional funds within the general fund set aside for summertime payroll costs. As of the end of January, the board had $17.2 million and change available in the general fund balance, though Financial Director Tammy McDonald reported that some of the money in the general fund will be needed when school is out to help meet payroll costs during the break. The district's SPLOST funds remain healthy as well, with combined funds from SPLOST V and SPLOST VI accounts at more than $4.8 million, and much more set aside in construction accounts as work continues at buildings around the district programmed in the 2017 E-SPLOST request from the district. That money has and is being used for improvements at Cedartown and Rockmart High Schools and other campuses, including some athletic facility improvements as well. The keystone projects remain the soonto-open Animal Sciences facility at Rockmart High School, and the under construction Fine Arts addition to Cedartown High School. National School Board Appreciation Week was being celebrated a bit early for board members at their latest meeting. The opening of this week marked the start of the week celebrating those who serve local districts across the country, and Polk School District administrators and staff took the time early during the March 12 session to ensure that board members know they care and appreciate all their hard work. Cakes were made for each board member to take home with the PSD logo on top, and board members were honored with certificates for their service as well. That includes the 27 years on the board for Tommy Sanders, who was re-elected for a new term in 2018. When certificates celebrating the board's service were handed out, Sanders said that during his term he's had children and grandchildren graduate from Rockmart High School, and the legacy continues with more Sanders in the district. One final grandchild graduates with the Class of 2019 and great-grandchildren have already begun their careers in the Polk School District. School board members also had the task during the night to determine who'd represent the district at the Georgia School Board Association's annual assembly in Savannah in early June. Board Chair Bernard Morgan was nominated to serve as the delegate for 2019, and board member J.P. Foster was nominated to be the alternate at the forthcoming assembly. Both were approved unanimously. School nutrition workers were given the spotlight during March for the monthly M.E.R.I.T. Award given out by Polk School District in cooperation with Floyd-Polk Medical Center. Assistant Superintendent Dr. Katie Thomas said during the awards presentation that when nominated, everyone provided all positive remarks about the service that Julie Durham at Van Wert Elementary presents daily with a smile. "She's a wonderful inspiration to all students and staff," Thomas said that one nomination form included, and more. "She's always kind and friendly, and always has something nice to say to everyone." M.E.R.I.T. nominations are gathered for a 30 day period for consideration. The Polk Retired Educators Association also took time out during the March 12 meeting to hand out their annual new teacher grant. This year, Gladys Gipson gave the $500 grant to Young Grove Elementary's Timothy Warren. She said it was his passion for education that provided PREA with the perfect nominee for 2019. "It is a joy to hear him talk about his children, and selected him some time ago based upon the answers to the questions on the application," Gipson said. Warren is the music teacher at Youngs Grove, a graduate of Shorter University with the Class of 2017. A Rockmart businessman and council member seeks to continue the work already underway to improve the lives of local residents as his key platform in a run for mayor in the coming municipal elections. Sherman Ross, Rockmart's Ward 4 Council Member and owner of Sherman Ross State Farm Insurance, announced his intentions to run for mayor ahead of the August qualifying period as the week came to a close. The second-term council member seeks in his run for a new office in local government to continue a path toward improvements for the community in an open seat for the 2019 ballot. statement on Friday evening. "I am a servant leader and have the leadership skills to lead and ability to collaborate with others to achieve positive results for the benefit of our Citizens." Ross moved to Rockmart with his wife Debbie in 1995, and for the past 23 years he's owned and operated his State Farm Insurance business. He's been with State Farm companies for the past 36 years. Since moving to Rockmart, Ross became involved in several initiatives, including but not limited to leadership roles in Rockmart-Aragon United Fund, Fellowship of Christian Athletes Board, Polk County Planning Commission, City of Rockmart Planning Commission, Rockmart Business Alliance, Polk County Chamber of Commerce, Sara Hightower Library Board, Habitat for Humanity-Coosa Valley and as one of Polk County's two representatives on the Highland Rivers Health Governing Board of Directors. Ross also is a longtime member of the Rotary Club, and attends services with Debbie at Crossview Church. He was first voted into office in 2013 in a contested race, but ran for a second term in 2017 without any challenges on the ballot. In his statement Friday, Ross said that "It has been an honor to serve as City Councilman and work alongside Mayor Steve Miller, City Manager Jeff Ellis, City Clerk and Financial Officer Pam Herring, our Department Supervisors, City employees and my fellow City Council members." "As the result of leadership and stewardship from past and present Mayor(s), Council members and employees, our City is financially strong, our Citizens have the benefit of a Library, Arts and Theater programs, Recreation program, Department of Community Development Fire, Police, Public Works and Water and Sewer Departments, that strive to serve and protect in a first class manner," his statement continued. Ross already has an idea in mind of a direction he wants to continue steering the city, with a focus on making it easier for people to invest in business, and keeping Rockmart clean and safe for all. "We want to encourage people to take care of their properties, which enhances everyone's property and makes the city more attractive to outside investors," he said. "We're in great shape. We've got a beautiful city, I think. But it can be even better, and our whole community can benefit — our businesses and schools." His statement added that "My vision as Mayor would be to work with Council members and our City Manager to continue to enhance customer service, code enforcement, plan for infrastructure needs, Community Policing and encouraging investment in our City." Ross is the first candidate to announce their intention to seek the Mayor's seat following the announcement by Mayor Steve Miller that he wouldn't seek a new term in office, keeping a promise he made to only serve two terms. Flames shot out of the roof of Southern Dream Supply in Cedartown on the afternoon of Friday, March 15. The interior of Southern Dream Supply in Cedartown was destroyed by fire and the roof collapsed on Friday, March 15. 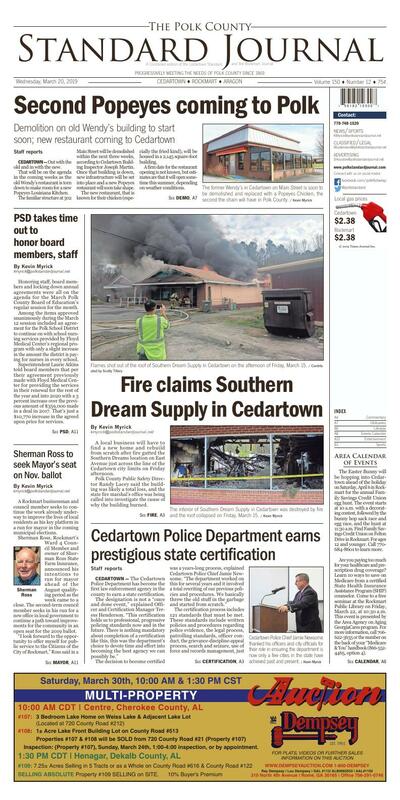 Southern Dream Supply in Cedartown was ruled a total loss after a fire on Friday afternoon, March 15. A local business will have to find a new home and rebuild from scratch after fire gutted the Southern Dreams location on East Avenue just across the line of the Cedartown city limits on Friday afternoon. Polk County Public Safety Director Randy Lacey said the building was likely a total loss, and the state fire marshal's office was being called into investigate the cause of why the building burned. Fortunately, no injuries were reported this afternoon when fire crews were wrapping up at the scene. Lacey said the first call to firefighters came around 2 p.m., and the building was found with heavy smoke coming out of the roof. "We made an interior attack through the front door with a 2 1/2 inch (water) line," he said. "We got in there deep, but the roof collapsed and we had to pull back." The building next door to Croker's Hardware in Cedartown at 1196 East Avenue was the home to Southern Dream Supply, a screen printing and embroidery business owned by Sharon Robinson. The building, owned by Croker's Hardware owner Scotty Tillery, was likely a total loss. However, the building separated just a few feet away remained mainly unharmed by the flames. Cedartown and Polk County Volunteer Firefighters responded and were able to attack the fire and keep it from spreading to the neighbors, but weren't able to save the structure before the roof collapsed. Lacey added that investigators are expected on Tuesday to help conclude the source of the fire and why it happened. Cedartown Police Chief Jamie Newsome thanked his officers and city officials for their role in ensuring the department is now only a few cities in the state have achieved past and present. The Cedartown Police Department celebrated their achievement of becoming a certified agency for 2019 through 2021. CEDARTOWN — The Cedartown Police Department has become the first law enforcement agency in the county to earn a state certification. The designation is not a "once and done event," explained Officer and Certification Manager Teress Henderson. "This certification holds us to professional, progressive policing standards now and in the future. There is nothing mandatory about completion of a certification like this, this was the department's choice to devote time and effort into becoming the best agency we can possibly be." The decision to become certified was a years-long process, explained Cedartown Police Chief Jamie Newsome. "The department worked on this for several years and it involved a total rewriting of our previous policies and procedures. We basically threw the old stuff in the garbage and started from scratch." to name a few. "Not only do your written policies have to be lined up with the standards set forth by the Georgia Association of Chiefs of Police (GACP), but your department's actions and follow-through must reflect those policies," Henderson explained. "With this certification, we are not only seeking to be an agency of excellence, but we are asking the state's certification agency to hold us accountable." One might wonder why a police department, under so much pressure already, would elect to go through the rigorous certification process. Chief Newsome answers that questions succinctly. "When the citizens of Cedartown call on us for help, when they are asking us to provide a service, we want them to know they will receive the best, most professional, most trained, most well-equipped officer that this department can provide." In addition to greater public confidence, other benefits are attractive to an agency as well. Once certified, the agency confirms that their practices are consistent with progressive professional standards, operational and administrative effectiveness is increased, officers develop a deeper understanding of agency policies and practices and agencies receive a 20 percent discount on liability insurance. The certification process got down to the nitty gritty in November, when Henderson said the department felt ready and prepared for an examination by the state board. The board is comprised of four certification standard experts. Those experts spent two full days in Cedartown, checking policies, procedures and compliance. Their observations are then sent to another statewide board that ultimately decides if a department is ready for certification. Chief Newsome was notified in late January that the Cedartown Police Department fully met the qualifications for certification. An official presentation by Brian Harr, Chief of the Hogansville Police Department and Chair of the Certification Assessment Committee was made at the March 11 Cedartown City Commission meeting. "While I acknowledge that the certification happened under my watch and I was a motivator, this achievement would not have happened without Teress Henderson and her day-to-day 'get it done' attitude," said Newsome. "She has hundreds of hours invested in this and I couldn't be more proud. Officer Russell Stroup assisted Teress in making final preparations and Sgt. Andre Nicholson is an excellent force in officer training standards. He ensures that trainings are in accordance with state standards and trains our entire staff." Newsome stated that re-assessments are required every three years in order to ensure departments are still in line with state policies and standards. This report was provided by the City of Cedartown. The Easter Bunny will be hopping into Cedartown ahead of the holiday on Saturday, April 6 in Rockmart for the annual Family Savings Credit Union egg hunt. The event starts at 10 a.m. with a decorating contest, followed by the bunny hop sack race and egg race, and the hunt at 11:30 a.m. Find Family Savings Credit Union on Felton Drive in Rockmart. For ages 12 and younger. Call 770-684-8601 to learn more. Are you paying too much for your healthcare and prescription drug coverage? Learn 10 ways to save on Medicare from a certified State Health Insurance Assistance Program (SHIP) counselor. Come to a free seminar at the Rockmart Public Library on Friday, March 22, at 10:30 a.m. This event is presented by the Area Agency on Aging GeorgiaCares program. For more information, call 706-622-3635 or the number on the back of your "Medicare & You" handbook (866-552-4465, option 4). Need to get an item onto the Area Calendar of Events? Email kmyrick@polkstandardjournal.net today! All items must be in at least two weeks before the event to appear in the Standard Journal on time. Mark calendars now for fun during springtime in Cedartown. The Cedartown Junior Service league has their community Easter Egg hunt planned for Sunday, April 7, 2019 at 2 p.m. at Peek Park. Check back for more information about the event in March as it draws closer here in the pages of the Standard Journal. Life Matters Outreach Pregnancy Resource Center will be hosting their first-ever fundraising golf tournament on Friday, March 29th at Cherokee Golf and Country Club. Registration is open to individual as well as 4-player teams. Early registration deadline is March 22 and the fee is $75 per player. After that the fee will be $100 per player. Proceeds go to fund the many free services they offer which include Pregnancy Testing, Pregnancy Options Counseling, and Support Programs for the community. To find out more information about LMO and to register for the golf tournament go to www.LifeMattersOutreach.net or call 770-749-8911. Do you think you might be pregnant? You can know for sure. Contact Life Matters Outreach today to schedule a free pregnancy test. You have a right to know all the options available to you. We offer free evidencebased education and resources so that you can make a well-informed decision. The services provided at LMO Pregnancy Care Center are free of charge. Clients are treated with respect and unconditional acceptance. We are here to help YOU. Call 770-748-8911 for more information. Anna Kresge Memorial United Methodist Church's Men's Club is holding a Fish Fry fundraiser coming up on Saturday, April 6 from 4 p.m. until 7 p.m., or until the food is all sold out. The menu includes catfish, slaw, hushpuppies, fries and a drink. Eat in or carry out is $9 a plate. Call 770-748-4308 to learn more. A day of gospel and praise is planned with the Hess Family Band at the Cedartown Flea Market coming up on Sunday, April 7, starting at 11 a.m. The event is free to the public, but a love offering will be collected during the event. Everyone is welcome to attend at 591 West Ave., Cedartown. The Rev. Gilbert Richardson and the Ware's Grove Church family of 200 Potash Road, invite everyone to join the Impact Service held each Sunday at 9:45 a.m., followed by regular worship services at 11:15 a.m. Bible class is held Wednesday nights at 7 p.m. The community is also invited to join the congregation for a special Men and Women service to be held on Sunday, March 17, at 3 p.m.
Come join in welcoming new pastor Jimmy Douglas Bryant on Sunday, March 10 to Oak Grove Baptist Church on Highway 27 North in Cedartown with worship services starting at 11 a.m. Members, former members and pastors are also encouraged and welcome to come and worship as well on Sunday, March 17 as the church celebrates their 121st anniversary service at 11 a.m. Lunch will follow the anniversary service. The Gospel Talent Sharea-Thon is coming soon to the Outreach Tabernacle and Gospel Music Park at 1351 County Road 31 in Muscadine, Ala. The March 30 event starts at 5:30 p.m. central and will feature soloists, duets, trios, quartets and musicians. Join and share love of the community. For more information call 770-712-1032 or 678-925-0903.